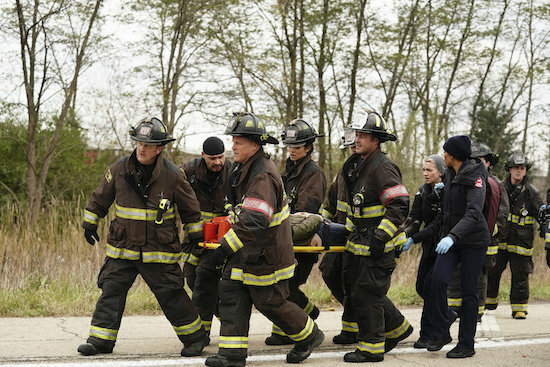 CHICAGO FIRE’s fall finale turned up the heat as Casey (Jesse Spencer) found his life in danger, Cruz (Joe Minoso) nearly lost his girlfriend in a tragic wreck, and Severide (Taylor Kinney) could be pushing Stella (Miranda Rae Mayo) away. As Casey and Naomi (Kate Villanova) were riding high after an apparent win in their trailer-park investigation, the duo took their relationship to the next step and slept together. Unfortunately, the joy was short-lived as Casey woke up to discover his apartment on fire. Can Stella and Severide survive this conflict? With Severide still mourning the loss of his father—and lashing out at Stella—the couple ended 2018 at odds, with Stella opting to hang out with her friend Tyler (Tye White), while Severide stayed home alone. Will Cruz catch a break? After hearing his girlfriend, Chloe (Kristen Gutoskie), get into a major crash in the fall finale, there was a bit of good news: she survived her major injuries and her parents are already crazy about Cruz. (It helps Chloe apparently couldn’t stop talking about him since the new couple met.) And it seems the two crazy kids might be able to go the distance.